I know - I have been AWOL for a few months! OK, LOTS of months! :) But, I'm back! I've just returned from a spontaneous trip to Greer, AZ - in the White Mountains of Arizona! You might say, "so what! ", but this is a great, hidden treasure in Arizona, near the New Mexico border. Many folks in Phoenix and Tucson have never even been here - I was shocked to hear that so many locals are not aware of this Jewel in our own backyard! Never heard of them? You are not alone! These are great, small towns (click here for map) along State Route 260 and US Highway 180 in the White Mountains of Eastern Arizona. These towns are not far from the better known Show Low, Payson or Pinetop - but a world apart in character, local hospitality and country laid-back lifestyle! Wednesday morning last week I awoke with a wild idea to head to the mountains and do something different, get away from the "city", the heat and the same ole', same ole'. 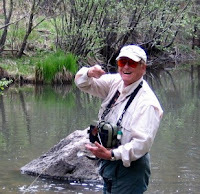 So I decided to call a very good client, and now friend; well known and highly regarded fly-fishing guide, Chip Chipman. Chip and his wife Penny are clients of The Cruise Place and I had heard great stories about guiding, and the beauty of the White Mountains. So I shot Chip an e-mail and he happened to have time to give me some lessons on Saturday and a guided fishing trip on Sunday - PERFECT! Chip directed me to the Greer Lodge and Cabins - and I booked myself a cabin - not really sure what I was getting, but just glad to get a place this close in. The Greer Lodge is one of the best lodges in the area and almost always booked well in advance. One of the "Lodges" is called the Red Setter Inn and is actually a B&B within the resort grounds. It was named one of the Top 10 B&B's in the WORLD by Fodor's! (click here for the article). I knew I was in for a GREAT weekend! I arrived Friday afternoon around 5:00 PM, after an incredible 4 hour drive from Tucson, via Oracle, Globe and Show Low. The drive was a perfect way to leave the hassles of the work week behind, put on some Jimmy Buffett CD's and enjoy the scenery! And its was AWESOME! The terrain quickly changed from desert scrub brush and cacti to pine trees, meadows and green, green, green. The monsoons have made the mountains as lush as the deserts I love. The big difference - it was now 71 degrees vs. the 105 degrees I left behind a few hours ago. The 373 Grill, named after the highway that takes you the last 5 miles from the main road 260, is a perfect spot to sit back, relax after a long drive or a day of fishing, hiking, horseback riding or any of the other activities in the area, and have a cold beer or glass of wine and take in the scenery! The Grill has indoor seating or a patio with fresh air and grand vistas. I decided to head back to the cabin, watch a DVD I brought and start a new book I've been wanting to read - a perfect ending to the first day of my Fly-Fishing Adventure! When I checked in the previous day - everyone working in the office said that I MUST get up early, and walk the property, as the monsoons have brought out the local Wildflowers as well as the Wildlife! So here we are, 6AM, hot coffee in hand and 59 degrees out - YES! :) The grounds of the Greer Lodge are incredible. I enjoyed about an hour hike, sighting deer, trout in the streams and yes - lots of wildflowers - it was one of those perfect mornings - and I was only an hour away from meeting Chip and my first Fly-Fishing lesson. Greer Lodge has stocked ponds that are used for guests to practice either on their own, or with a professional Guide. I looked around at all the frustrated fathers with their kids, and husbands with their wives (enough said) and was glad I had decided to call Chip! We spent two hours going over all the basics, the Roll Cast, The Overhead Cast, The False Cast, as well as reading the water and refining the techniques. Chip was a great teacher and made it all come together. At first I felt like we were flailing around and it was not working, but within a few minutes of coaching it all started to feel right and I was getting in the groove. Now I was still not very good at it - but I was having fun and starting to get the fundamentals! We finished the lesson and I headed back to my cabin around noon. I was planning on going back to the ponds and practice this afternoon and take in some horseback riding, but the monsoons came in with a fury around 1:00 PM and did not let up until after 7:00 PM - so my activities where out - but the show was great - and I settled in for the afternoon to read my book - also by Jimmy Buffett, "A Pirate Looks at Fifty!" Talk about escapism - it was a unique afternoon of reading, watching and listening to the storm and dreaming of all the adventures and far away places in the novel. It was early to bed - as tomorrow Chip and I are hitting the streams near his home. Time to pack, check out, grab some coffee and head the 45 minutes East to Nutrioso to do some Fly-Fishing! The morning was cool, crisp, overcast and smelled of pine! Chip and I met at the post office in town and headed to his home where I would leave my car. We got in his truck and headed to the East Fork of the Black River - where Chip knew all the "hot" spots! The water was high from the storms and Chip said these where going to be tough conditions, but we decided to try one of his favorite spots anyway. I forgot everything from yesterday, so at first I was all over the place - fly in the bushes, fly in the trees, everywhere but where Chip was directing me at in the stream! It came back pretty quick and we kept working on getting the fly out to the right spot and then the stripping technique was worked on. After about 15 minutes we had our first fish! It was an Apache Trout and about 8 inches long - what a rush to catch the first one - and I knew if we caught no more - at least when I got home and my mom (an avid fly fishing fan) called, I could say we caught one! The "big" one! About 10 minutes later we had another hit and this guy was a fighter (but what did I know - this was my first time!) and I had a great time reeling this one in. Chip seemed a little shocked at the size, but I'm not sure if he was just making the trip more fun. I reeled in a 14 inch or so Brown Trout and it was bright, colorful and feisty! This trip was just catch and release, so we let him go and went back to looking for the next one. In the first 2 hours we caught another Brown Trout at 16 inches and another Apache Trout at about 7 inches - WOW - what a morning! We decided to try some other spots down the road, but did not have any luck in those areas, so we decided to take our last 20 minutes and go back to our original part of the stream for one last try. We had a few hits, but no more fish. It was a great day of fishing and learning about fly-fishing from a pro like Chip. I highly recommend taking a few lessons if you want to enjoy this (or any new activity) to it fullest! Traveling by ship and canoe!